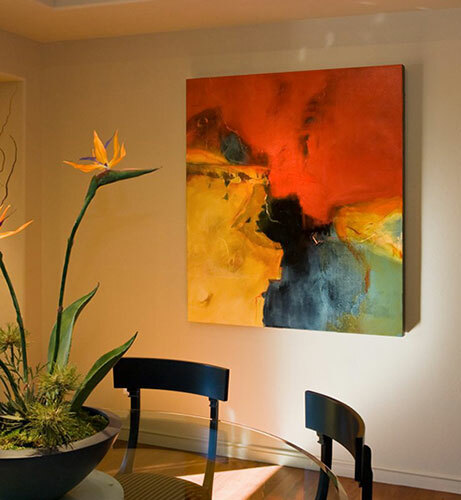 This Foothills home has become the perfect place for Martha Braun to create and “test out” her artwork. When Martha Braun went shopping for a house in Tucson, she had an extra requirement that isn’t always on buyers’ lists. The house had to be suitable not only to hang lots of art, but also to house her own artist’s studio. 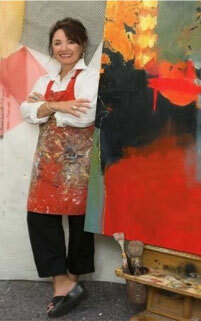 Martha is an abstract artist who’s making a name for herself with vibrant pieces that use mixed media and textures. She didn’t find a house that came with a studio ready-made. But thankfully for her and her husband Vincent, she had 25 years of interior design experience behind her and knew exactly how to convert a 1993 Foothills home to her liking. The 5,000-square-foot, three-bedroom slump block home is rich not only in views and location, but also in wall space that serves as her own personal art gallery. Wall space aside, when the Brauns moved in, there was tweaking to be done. Where there used to be an interior koi pond in the middle of the entrance hall, there are now two extra rooms. Martha had her contractors fill in the two tall columns that framed the pond to create a wall and an extra floor. Now, a work-out room sits where the pond used to be, and her painting studio is on top of it. 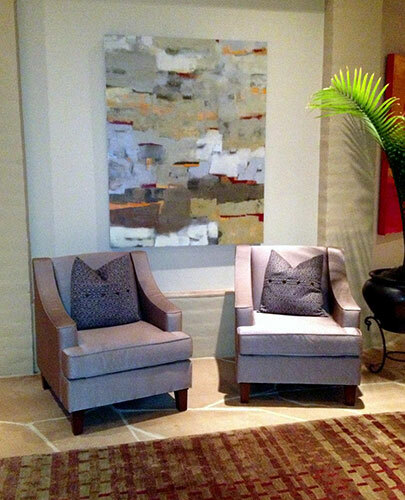 An abstract artist, Martha is now known for her warm, splashy pieces. 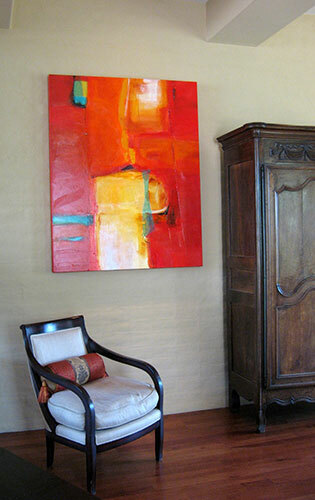 In a throwback to her interior designer days, she uses thick, household paintbrushes on her canvases. And she always works on two paintings at the same time. The couple, long-time Marin County, California, residents who also had spent some time in New Mexico, moved into the house in July 2005 with their two big, cuddly, mixed-breed dogs, Mutley and Maggie. It took Martha less than a year to transform the residence. Although she still has work to do on the kitchen, she has had hardwood cherry floors installed in several of the rooms, and in the living room, two wall areas were punched out to make space for extra picture windows. 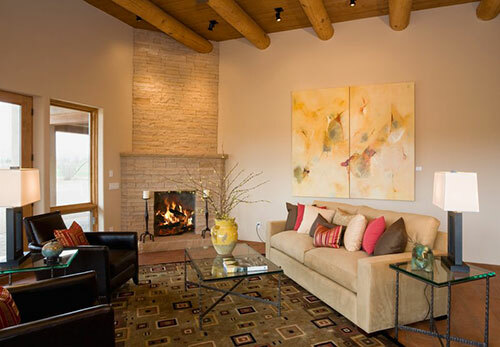 With flagstone in the hallway, beamed ceilings in the master bedroom and stone and tile accents throughout, the house has a rustic feel, but with a contemporary edge. Martha admits she was tired of certain materials, like granite and marble, and wanted to experiment. So in the master bathroom there’s a split limestone floor, a shower based made of pebbles, and brushed slate countertops. The bathtub from Benjamin Supply is imported from England. Old-fashioned in design butg modern in its engineering, it looks like a cast-iron bath but is made of acrylic, thus holding in the heat. And the faucets sit perched on the window ledge, rather than in the tub. Cherry cabinets and gray-toned walls keep the modern look. And, ever the painter and designer, Martha frequently customizes her household paint to create her own colors. She has a love for Asian furniture, and a red antique armoire dictated the style in the master bedroom – deep reds, sheers and silks from Dillard’s and Pottery Barn draped over a cast-iron four-poster bed. 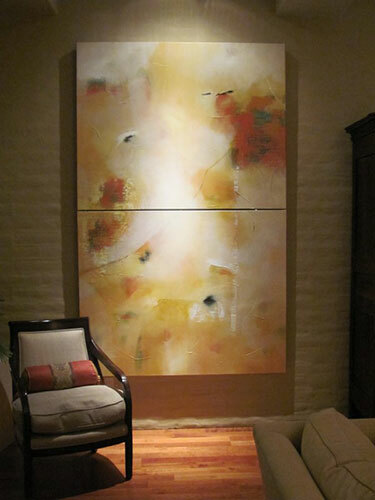 She also likes to mix things up: her modern, abstract art hangs close to a 200-year-old tapestry, for example; and a sleek French armoire, antique Persian rug, contemporary sofas, and a baby grad piano have all earned their place in the living room. The land surrounding the house sprawls across two acres, although the Brauns’ outdoor living space is contained to a courtyard, and back and front patio (in red brick), with a negative-edge pool. Again, the Brauns kept it in the family, with Vincent’s own company – Palo Verde Landscaping – renovating the outside. After a long career in interior design, Martha says she’s happy to concentrate on her painting, which she’s been indulging in for about nine years. “I lose myself in there,” she says of her work, which she began to sell about six years ago. She uses layers of paint, high-end paper and pieces of Asian calligraphy. The process is like fitting out the interior of a house. To see more of Martha’s work, visit her website at www.marthabraun.com.